^ Ross King. 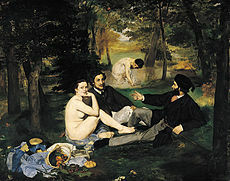 The Judgment of Paris: The Revolutionary Decade that Gave the World Impressionism. New York: Waller & Company, 2006 ISBN 0802714668. ^ Cachin, Françoise. 第二章：波特萊爾與西班牙—「我在西班牙的最愛」. 《馬內：「我畫我看到的！」》. 發現之旅. 53. 李瑞媛/譯. 臺北: 時報文化. 2001年7月16日: 第29–31頁. ISBN 978-957-13-3426-4 （中文（台灣）‎）. ^ Paul van Rensburg on 印象派 互联网档案馆的存檔，存档日期2007-07-07. ^ 9.0 9.1 9.2 Krell, Alan, Manet and the Painters of Contemporary Life, page 83. Thames and Hudson, 1996. ^ The Digital Collection of the New York Public Library.